Recently, the National Gallery has become a little bit more…noisy. Queues of people are lining up in the Central Hall surrounded by 16th century Northern Italian paintings, while others exit into the Spanish room where Velázquez’s ‘Rokeby Venus’ (1646-51) resides. Something’s happening in the Sunley Room, and this time, Michael Landy takes centre stage. Michael Landy and his kinetic sculptures. Image via www.telegraph.co.uk. 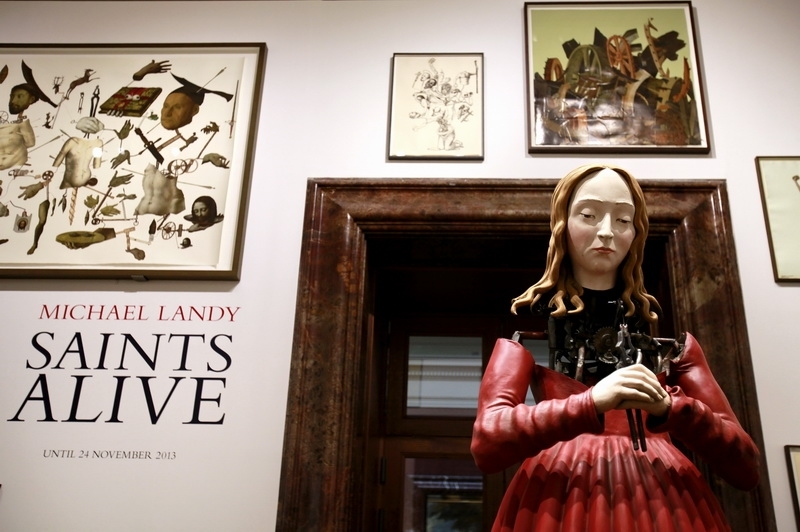 Entitled Michael Landy: Saints Alive, the exhibition is exactly what it says on the tin. Saints from a multitude of paintings are deconstructed and remoulded into kinetic sculptures about three metres high. Since they are kinetic sculptures, it must mean they can move – and they do! Below each work is a foot pedal which visitors can step on to ‘activate’ the sculptures. There are a total of seven sculptures scattered around the room. Accompanying them, adorning the walls as we enter the room, are Landy’s drawings and collages that helped him plan these works. They consist of cut-out sections of photographs of the National Gallery’s collection, pasted on to paper, and connected with drawings of wheels and mechanisms. 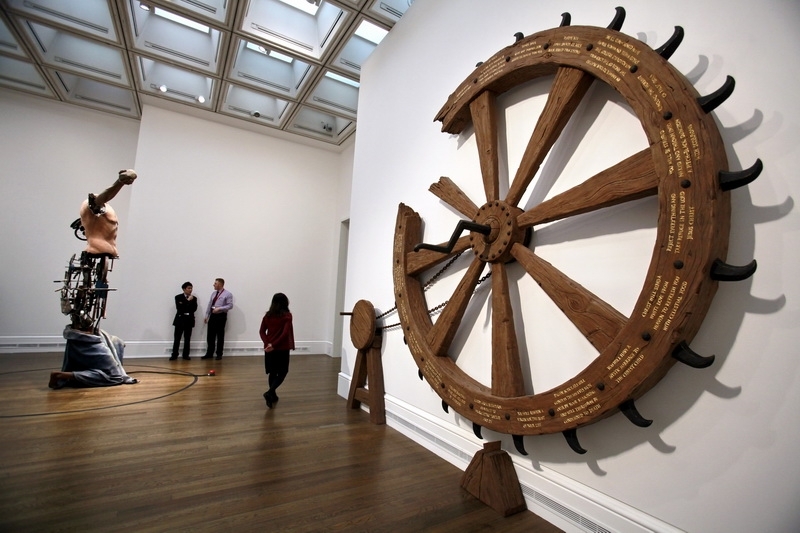 According to the 20 minute film shown in a connecting room, the initial inspiration came from Landy’s observation of the number of Catherine wheels – not to be confused with the fireworks of the same name – depicted in the collection. It might also be worth knowing that Landy had never been to the National Gallery until he was invited to produce the current works in the exhibition as part of the Rootstein Hopkins Foundation Associate Artist Scheme. The sculptures themselves are intended to be a fusion of Renaissance paintings and kinetic art of the 1960s-70s. The materials included in the works are evocative of that era, obtained through car boot sales and markets. I definitely saw some bicycle safety wheels in the mechanism for Saint Jerome. Saint Apollonia with Landy’s preparatory works. Image via www.theupcoming.co.uk. As we enter the room, we are immediately faced with the rather intimidating character of Saint Apollonia. Clutched with both hands is a pair of pliers, holding together a single tooth. Apollonia was tortured by having her teeth pulled out, so it comes as no surprise that the foot pedal causes the sculpture to mimic the act of tooth-pulling. Gradually walk into the larger section of the room and we’ll see Saint Francis of Assisi in the corridor with a donation box for a lower-half. Put a coin in and he’ll hit his forehead with a crucifix. I’m not sure whether it works for notes but I definitely saw several £20 notes at the bottom of the box. Continue inside and you’ll be greeted with Saint Jerome, probably the noisiest sculpture in the exhibition. He holds a rock in his hand and once you apply force to the foot pedal he’ll start to beat his chest with it several times, preventing himself from having impure sexual thoughts. I remember a school-girl there, as part of a school trip, who immediately screamed and backed away as a result of the impact between rock and chest. She tried it again a second time, this time entirely prepared. The Catherine wheel with Saint Jerome in the background. Image via www.theupcoming.co.uk. A working spiked Catherine wheel hangs on a nearby wall, inscribed with 19 gilded prophecies, hinting to the martyrdom of Saint Catherine of Alexandria. One of them refers to her supposed marriage with Jesus Christ, while another hints to the flowing of milk from her body instead of blood upon being beheaded. Facing opposite the wheel is a multi-saint, combining attributes from five different saints. There is the axe-blown head of Saint Peter Martyr, a griddle that hints at the martyring of Saint Lawrence, Saint Lucy’s plucked-out eyes presented on a wooden plate, the scales and armoured legs of Saint Michael with Satan crushed beneath his feet, and finally the appearance of a Catherine wheel. Unfortunately, the last two were non-operational when I went. In fact, the Saint Thomas sculpture was removed temporarily for repairs. Essentially, when turned on, the left hand of Saint Thomas will move back and forth, poking at the body of a spring-supported Christ, accusing him of being an impersonator of the real Jesus Christ. The final work is Saint Francis of Assisi again, but without a head. Connected to him is a crane that is supposed to pick out a t-shirt from within him to give to the general public, hinting at his giving away of his worldly goods. 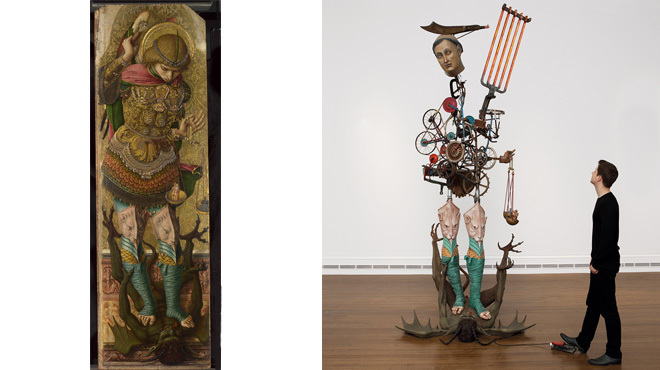 Carlo Crivelli, Saint Michael, about 1476 (left); Michael Landy, Multi-Saint, 2013 (right). Image via www.timeout.com. Landy said that visitors to the National Gallery are usually very passive. They can only engage with the works on display by looking, and this is where the artist chose to make his statement. By making his sculptures interactive, the audience are engaging, at least in part, with the work itself. The sculptures can’t move unless someone from the audience chooses to press on the foot pedal. Furthermore, the eyesore of seeing contemporary art at the National Gallery is something that Landy rather liked the idea of. Contradictions literally come together in this exhibition. The usual quiet atmosphere is disrupted by the mechanical noise of the sculptures. 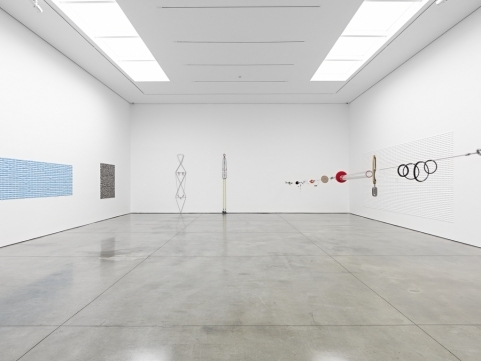 The physical fact that they are sculptures is contrasted against the gallery’s sole collection of paintings. But the greatest contradiction of all is Landy’s ‘to create is to destroy’ type method of producing art. By deconstructing and destroying what is already available, he is creating something unique, something hybrid that harmoniously connects extremities into a single body of art. The exhibition is small, but still rather fun. Personally, I enjoyed seeing the expressions of the people around me, how they flinch, or how they admire curiously at these odd, kinetic machines. For a free exhibition, there really is nothing to lose. Michael Landy, Jean Tinguely’s Homage to New York Fails to Destroy Itself in the Sculpture Garden, 2007. Image via www.thomasdane.com. 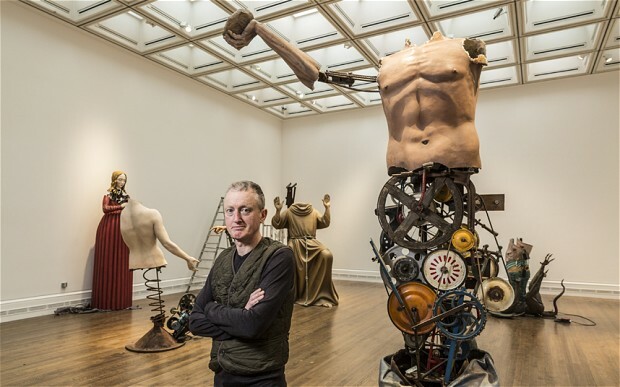 To know more about Michael Landy and his work, check out the two-part exhibition at the Thomas Dane Gallery entitled 20 Years of Pressing Hard: Michael Landy. Split between two buldings – 3 and 11 Duke Street – the exhibition introduces us to his drawings from 1993 to 2013. Several bodies of works are on display, including the H.2.N.Y. series (2006-9) that revolves around a self-destroying machine installed by Jean Tinguely at MoMA’s sculpture garden. There is a parodic Scrapheap Services series (1993-6), etchings that form the Nourishment series (2002), and of course several drawings from his residency at the National Gallery. Lower ground floor of the Jac Leirner exhibition. Image via www.whitecube.com. After scouring through the repetitively, unique Jac Leirner: Hardware Silk exhibition at White Cube Mason’s Yard – followed by several detours into some incredible commercial galleries nearby – I decided to rest for a moment with a triple caramel frappucino before heading into the Royal Academy’s annual Summer Exhibition 2013. 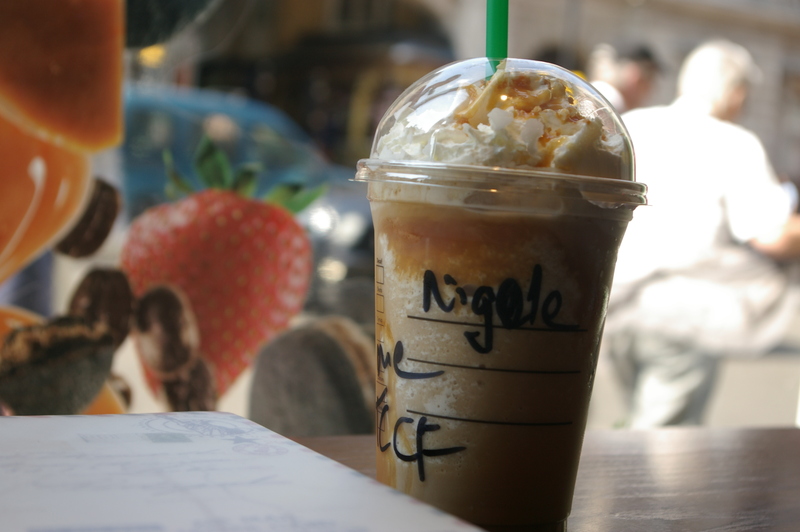 They spelt my name wrong! Own photograph. Michael Landy: Saints Alive runs until 24th November 2013 at the National Gallery, London, www.nationalgallery.org.uk. 20 Years of Pressing Hard: Michael Landy runs until 27th July 2013 at the Thomas Dane Gallery, London, www.thomasdane.com. Jac Leirner: Hardware Silk runs until 6th July 2013 at White Cube Mason’s Yard, London, www.whitecube.com.